Nonetheless, I managed to fit in a stop at Montezuma NWR between meetings this weekend. 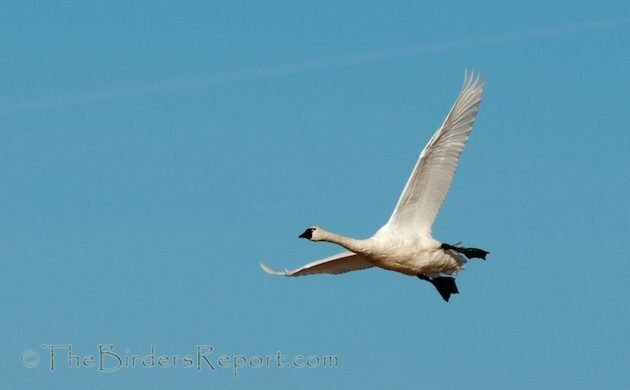 Nothing surprising turned up, but I don’t see Tundra Swans often enough to be jaded about them. Corey, on the other hand, did not go birding a single time this weekend, an oddity he attributes to his continued recovery from his western sojourn. Despite his not going to the birds, the birds came to him and his Best Bird of the Weekend is a tie between a Cooper’s Hawk that tried to thin the neighborhood pigeon flock and a Baltimore Orioles that, oddly for late August, flew over his balcony while singing. Dozens of beautiful Common Murres when I was out on a bay here on the Olympic Peninsula. When a boat gets near, they don’t dive as quickly as other seabirds. But when they dive, they often come up and shake all the water off, showing their white bellies. Turquoise Cotinga at Luna Lodge, Costa Rica. My best bird came this Monday morning, when I finally spotted a Black Tern amongst the Least, Common, and Forster’s Terns at Mecox Inlet, Suffolk County, NY. A pair of Varied Buntings, even if they were spotted in a nasty rain storm!